Yesterday did not go so well. Women at church joke with me that brain capacity and memory decrease with the birth of each child. I think yesterday should be my sign that two kids are plenty enough for me. I don’t have much brain capacity left to spare. There was lots of crying in the morning because the kids were so tired (in 36 hours, we went to my sister’s house in Simpsonville, saw Russ’ great aunt in Clinton, had lunch with my dad’s side of the family in Laurens, and had dinner with Papa and Mimi in Columbia – all on little sleep because Caleb decided to wake up at 4:15 am on Monday – road trips to my sister’s house do not go well). Anywho there was all the crying and melting down and weeping and gnashing of teeth. But miraculously we still made it out of the house on time. I dropped both kids off, then headed back to my car when I realized that the tuition check was still in my pocket. So I went back in to drop it in the payment box – to the amusement of the office staff. Then on my way back to the car I remembered that Taylor was supposed to bring in an apple for an activity. (It was actually supposed to be brought in on Friday, but I forgot it then, too, but the teacher said they weren’t using them until Tuesday, so it was ok…except that I still forgot on Tuesday). So I went to the grocery store to buy an apple. Got back to the school and got half way to the door before I realized that I left the apple in the car. The day got better once I got to work (aside from getting drenched on my multiple trips from my car to meeting locations and the time I walk with such gusto out of my office on a mission but then promptly forgot what that mission was as soon as I crossed the threshold of my office leaving me standing disoriented in the hallway for a few minutes amusing the secretary). I picked up the kids and went back to the grocery store because we were out of milk. Got home and left said milk in the car for 15 minutes before I remembered it was in there. 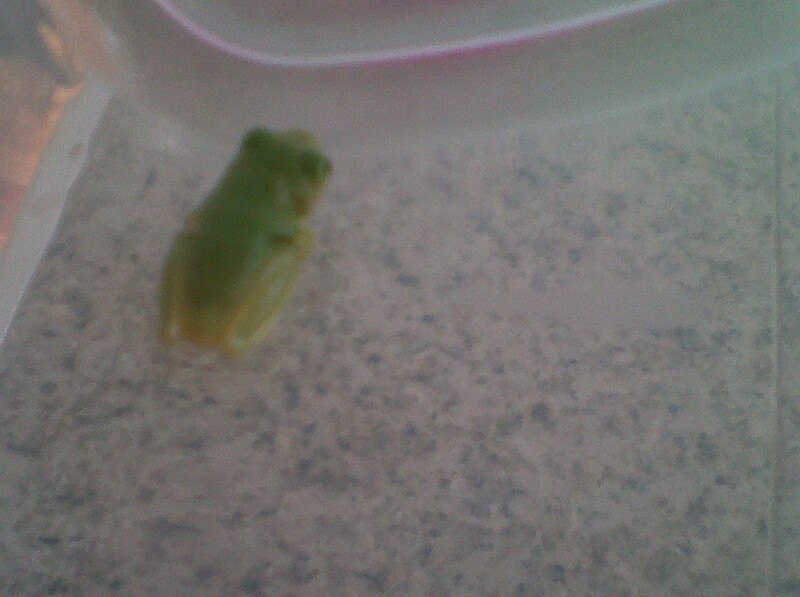 I headed back to the car, got the milk, took it out of the bag, and this little guy hopped from the milk job onto the kitchen counter. I might have screamed a little. Lord, help me. and also my kids. it will be a miracle if they survive. FYI – you left your Zaxby’s at our house… and we ate it. We wouldn’t want it to go to waste. Your forgetful mind benefited Ry’s belly. It’s not your fault. They were with us in a room for a week in KY…not sure what their deal is…I think it’s because we try to cram too much into a short amount of time whenever we are staying with you. And in my defense, I saw the Zaxby’s and left it on purpose because it wouldn’t keep in the car – but I did forget to tell you.